I found that choosing a diaper bag was almost as complicated as choosing a crib or dresser. When I first commenced my search for one, I had no clue as to what I wanted. What I did not want was something feminine. I knew that it had to be masculine enough for my husband to also wear it and not complain for the following year or so. After several weeks of searching online, I finally came across a bag so fitting that I had to pinch myself. It was the Jungle Leather Nappy Bag. Australian designed, this bag by OiOi was so gorgeous that I knew that nothing else could compare. Made of lambskin and antique gold hardware, I was almost salivating over the photos. Then I saw the cost. They are priced at $400.00 CAD. I sent a picture to my sister and she said to buy it now while we still have money. After days of contemplating purchasing the bag, I inevitably backed out. I could not justify spending more on a diaper bag than on a crib. Then came my brilliant idea. I think that the reason why I loved the bag so much was because it had reminded me of a similar one that my stepdad had given my husband and I. It was his vintage, leather messenger bag that he had once owned. My husband had since been using it to keep important documents, but it remained tucked away in storage for the last five years. After fishing it out of a box and giving it a quick wash, I was elated to finally have a diaper bag. One that was so unique and gender-neutral that we could both proudly wear it. Best of all, we saved hundreds of dollars. Now that we finally had a diaper bag, it was time to fill it. Deciding on the contents as first-time parents was a feat in itself. After several trips to baby stores, and one to my sister’s home to raid her bag, we ultimately had the essentials figured out. I know that we will be adding more once our baby comes into this world. Was anyone else as picky about diaper bags as I was? 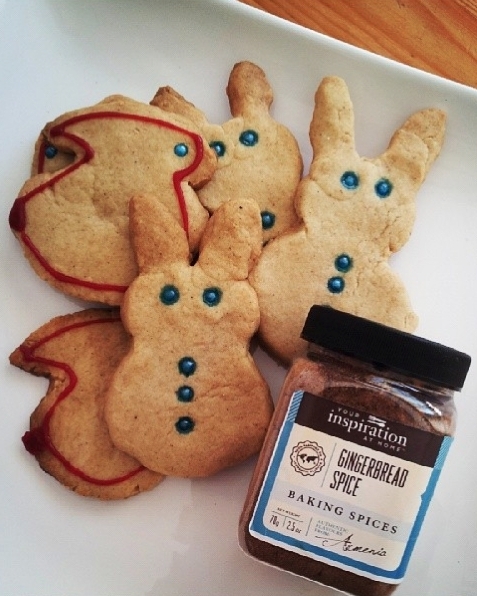 I am so honoured to have Susan Parry sharing her gingerbread cookie recipe on A Blogger’s Dozen. Susan joins us all the way from Australia. She is a wife, mother, baker, cook, blogger, and the heart, body, and soul of ‘Your Inspiration At Home’. This beautiful and delicious recipe today is not only tried and tested out to be scrumptious, but is also just in time to serve as an additional Easter treat. So whether you are reading this post on your android, computer, iPhone, tablet, or by any other electronic means, keep in mind that it is roughly a sixteen hour plane ride from Canada to Australia. Suffice it to say that this post has traveled half way across the world to come to you today, so it’s guaranteed to be a great one. Preheat oven to a 150°C or moderate oven. Cream butter and sugar until creamy. Add egg yolk and beat well. Gradually add dry ingredients and mix well. Warm golden syrup in microwave on low and add to the mixture and mix well. Knead mixture and roll out to about 3mm in thickness onto a floured table. You can cut shapes from cookie cutters or make your own shapes as we did. Place onto trays lined with greaseproof paper. Bake for 10 – 15 mins approximately until golden brown. Decorate with buttons before they have cooled or use icing after they have cooled. Let cool before serving. Makes about 12 – 20 depending on the size of your cutters or shapes. Have fun with this and I am sure it would be a winner. Please head on over to my blog if you would like to follow me and if you would like to check out my products head to my website which sends to the USA and Australia. Happy baking! A Blogger’s Dozen is a series that was launched in 2014. If you would like to be featured in a post, as well as have free advertisement for that month, please contact Emory at helloscarlettblog@outlook.com. Be sure to send any food-related ideas that you may have. Hello, awesomeness!